Here is a Q&A of one mother who graciously shared her story and advice in the most laborious job a mother will ever have. Mother’s Day is a day to celebrate women who we call mom. The women who were there when we cried when we laughed and all the in-between’s of life. It is difficult journey raising children, and with the help of the village, we send our hearts off into the world. Lori, please tell us about yourself. Yá’át’ééh shik’éí dóó shidine’é. Shí éí Lori Tapahonso yinishyé. Tódik’ǫzhi nishłį́, ‘Áshįįhi bashishchiin, Tódich’ii’nii dashicheii, Naakai dine’e dó Acoma Eagle clan dashinalí. Ákót’éego diné asdzáán nishłį́. Tsé Bit’a’í déé’ naashá. Hello, my family and my people. I’m Lori Tapahonso and am born to the Salt Water Clan and am born for the Salt Clan. My maternal grandfather is of the Bitterwater Clan. My paternal grandfather is of the Mexican People Clan. I was also raised by the Eagle Clan of the Acoma Pueblo. This is how I am known as a Navajo woman. The Rock with Wings is where I am from. My journey is to this very day is an interesting one. I grew up in Shiprock, NM, but spent the majority of my life in and around the Haskell University community in Lawrence, KS. I was drawn to the Midwest at 18 as I chased my theatre stage dreams straight to, what was then called, Haskell Indian Junior College. This is where my life’s endurance training began, so pay close attention. In the last semester at Haskell, I got married and had my oldest daughter, Chamisa Bah Edmo. My college professors still remember her as a quiet, content baby that intently listened during the lectures she attended with me. Yes, I was that young mom that insisted “I don’t trust anyone with my child,” but in reality, I couldn’t afford childcare. I remember talking with my brand new baby before class as softly and clearly as I could, “we’re going to class now. You have everything you need, so let’s get through this together and quietly.” My family always told us not to talk baby talk to our kids. We should instead talk to them like the intelligent humans they are. I graduated with an Associate’s of Arts in Liberal Arts with an emphasis in theatre at 20 years old. With the birth of my youngest daughter, Briana Nezbah Edmo, I was a mom of two by the time I was 21. Both of my daughters were not planned in this life, but part of a much higher, more important plan for my life. Right after Haskell, I started my bachelor’s degree at the University of Kansas in Broadcast Journalism. By the time I was 24, I was 8 hours from my degree, divorced, a domestic abuse survivor, and the sole provider for my daughters. I also wouldn’t have the courage to finish my degree for another eight years. In hindsight, I wouldn’t change a thing. If I spent my time on regret and resentment, it would diminish the personal, emotional, and spiritual strength I gained during those difficult times. In other words, I learned the valuable lesson there are no bad experiences, only opportunities for growth. In 2002, I graduated from the University of Kansas with a bachelor’s degree in Communication Studies with a minor in Broadcast Journalism. I also reunited with an old college friend who would later become my husband. In 2009, I graduated from Baker University with a master’s degree in Liberal Arts – Management and Leadership. And most significantly that year, I married my best friend, Jimmy Snyder. I my own life, as a daughter and granddaughter, in each step, each interaction, each success, each failure, I say to myself, what would my mother and grandmother think? Ultimately, how I move about in the world is a direct reflection on my lineage; the lineage that runs through the matriarchs in our family, quite literally. The women carry the Navajo clan system. When I speak or teach non-Navajo people, I describe our clan system lineage as being similar to the lineage of European surnames. For the Diné, the clans begin and end with the female. So, to answer your question, every day is Mother’s Day in the life of Indigenous women. The essences of the breath we take, the thoughts we think, and our daily actions, demonstrate the steadfast respect and reverence we have for the women and mothers in our lives. What challenges & triumphs did you face? Being a young mother was both rewarding and challenging. I was a fiercely independent child that grew into a fiercely independent woman. This means that, for good or bad, I had to figure everything out on my own. As a young mother, I learned pretty quickly that a stable support system was my only saving grace. I relied on family to help guide my daughters and me. I remember looking at my young children, who are only 18 months apart, and thinking that the only thing that mattered was sending out “good people” into the world. Everything I did was with that goal in mind. I knew that they watched me first as a guide to how to maneuver in the world. I knew that they gauged their actions based on their first teacher, me. What this meant was that I had to be careful how I move through this world. Their eyes were always watching. If I wanted them to treat people with respect, I had to treat people with respect. If I wanted them to show kindness, I had to explain kindness. If I wanted them to persevere through life’s challenges, I had to demonstrate to them how to do it first. I knew that their most important life’s lessons began with me, their mom. Please understand, being a mother was not all roses and glitter. There were the terrible twos, threes, and tweens. There were two teenage daughters under the same roof! At times, we all cried in frustration behind closed doors in different rooms. In those difficult times, I leaned on my family. I knew who to call to save me, save them, save our sanity. There is no “mom manual,” at least not one that I’ve found. We have to figure it out on our own. But, we never have to do it alone. How did you raise your girls & how did you balance the traditional world versus the assimilated world? My girls were raised in Lawrence, KS. Because we were so far from home (New Mexico), I made sure family surrounded them. My three sisters were a constant in their lives. They were not only accountable to their mom; they were accountable to their aunties and their uncles. Many desperate phone calls were asking one of them to help. Just the mention of going to see an auntie or uncle was enough to stop the fits, most times. Now, my sisters and their uncles were never mean or abusive. Most of the time, the girls just sat there quietly as their family members went about their business. But, they knew they were there for a reason. Most of the time, they came to their conclusion and could promptly detail why and how to correct it when asked by their auntie or uncle. For me, this approach was natural. I grew up with aunties and uncles to whom I was accountable. I knew it would break their hearts if they found out that I was misbehaving or acting out. They disciplined me but always reinforced by my parents. This instinctual way of raising my girls is how Navajo and native families have raised their children for generations. The parents or single moms are never alone. The family becomes bumper pads to life’s path. I have been blessed to be counted an auntie to many children, blood and heart-related. I have received those desperate calls. I have stepped up to help. What is most rewarding is seeing my adult daughters do the same. They answer those calls and selflessly assist when needed. They have already influenced the lives of the children who now call them auntie. So today, when I look at the strong, educated, compassionate women my daughters have become, I always first thank their aunties and uncles. How did you balance your life – as an individual, motherhood, profession? This is a difficult question to answer, maybe because finding balance is one of the toughest things to do. When my daughters were young, I was their sole provider. I only had my income to rely on, so I worked hard to make my ends meet. This meant long, hard hours in my office with kids and bagged dinners in tow. In those early years, I made sure that school activities and cultural events were a priority. But, in my personal life, I was a mess. I didn’t believe I’d ever been worthy of love. I didn’t think I’d ever finish my degree. I didn’t believe in myself. I remember a defining day. I was the program manager at a beautiful Native American mentorship program in Kansas City. Our goal was to help our urban Native students graduate from high school and realize the importance of a college education. I remember answering questions about college from a young woman in our program. She asked me how to know what degrees are right for you. Then she asked me how to use your degree afterward; she was interested in history. While I answered her questions as best I could, I had a moment of clarity where I thought, “yes, those are my questions too!” I hadn’t finished my degree. I had no idea how I got that far off track from my personal goals. Going to college and completing my college degree was why I moved to Lawrence, KS in the first place. After a few months of soul-searching, I took a leap of faith and applied back to college. Most importantly, I made my goals and my success a priority. For most moms, putting yourself first sounds counterintuitive. But, it’s necessary. You can’t water your seeds if your pitcher is empty. As mom’s, we are the essential water vessels. When I think back, I don’t know how long I would have been able to keep burning my candle at both ends. I was running on empty for so long that it seemed like “struggle” was my normal. I had to start thinking that by making my success a priority, my family would succeed. They would benefit from the higher paying job that I would be able to get. They would benefit from having me around more because of the better working hours. They would benefit from learning how to achieve goals, no matter how difficult they are. They would benefit from having a happier me. When my girls were young, they watched me learn to find balance. And as young adults, they now often remind me when I forget. It was my daughters that urged me to begin my jewelry business; Love Adorned by Lori Tazbah. I used to make jewelry for them as a stress reliever. I knew the pieces I made couldn’t be perfect, which was opposite of how I engaged professionally. I could let my guard down and allow the beauty of my jewelry take form. It was my therapy. I remember the day my daughter sat me down at the computer and said, “Look, you now have an online store!” I remember chuckling and saying, “Who on earth would want to buy the jewelry I make? !” Low and behold, I’m now years in and am still having fun. The best part is when I look at a finished piece of jewelry and can sit back and admire the perfection of the finished product knowing the struggle, hurt, and sometimes tears, which it took to create it. Yup, just like life. At all costs, find your joy and use that to help find a balance. It can be sewing, dancing, fitness, acting (my other love), or anything that brings you happiness. Use it to balance out the struggles in life. When feeling like you’re at your lowest, use that one thing to bring you back to center. It’s free, and it’s yours. A lot of mothers always think, “I’m not doing enough” or “I’m not a good mother” If this has gone through your mind, how did you change that mindset? I wrote this piece a few years ago in a flurry of thought. When I was done, I was taken aback in my chair. They push and pull through life. They painfully grind through the silky fabric of their existence. As I drove along, I felt an overwhelming urge to tell them… just be. I understood this to mean: There is no need to make life fit into your skewed little box, with all the rules that box you in and keep contentment out. It’s OK just to let go of the control…and let it be. For me, just the thought of such action created such a euphoric feeling; so free, so limitless and so happy. What was interesting was in that moment of non-judgment of myself, I realized that that very lesson was actually…for me. Be humble in your approach. If you make a mistake with your children, say sorry. They learn about responsibility and humility from us. There is no greater lesson to a child than to validate their worth through an apology. Don’t worry too much about doing it wrong. If it doesn’t turn out as expected, just be thankful for the first try and do it again better next time. When all else fails, lean on your support system. That system can be family, or it can be the friends you choose to become your family. Remember, you never have to struggle through parenthood alone. Someone has already done it, experienced it, and survived through it. Borrow their wisdom. 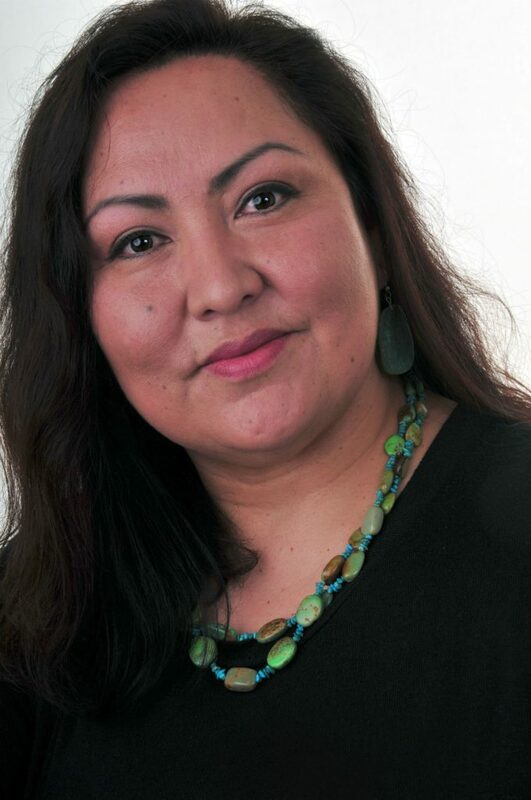 BIO: Lori Tapahonso (Diné) is a public relations specialist, a teacher, a consultant, a storyteller, a jeweler, and an actor. She is the daughter of Luci Tapahonso and Robert Martin of Santa Fe; and Earl Ortiz of Acoma. She is the granddaughter of Lucille Deschenne and Eugene Tapahonso of Shiprock; and Mamie and Joseph Ortiz of Acoma.